When I got into the classic mustang hobby I didn’t have a clue what to do. My regular car mechanic was good but he was a gm guy. My dad thought all old cars unreliable and ready to break at anytime. So I had to learn things from a young internet and a mustang club. 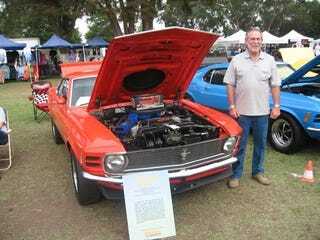 I meet Arnold Marks of Mustangs Ect through the Mustang Owners Club of California. He was patient, listened to my questions and taught me about Mustangs. He gave me advice and a few times a sandwich . He gave the kids of his clients toys or a box of cookies. He encouraged all to fix their cars in his open house days making sure the cars were fixed with help from his staff or himself. He even explained to my dad Mustangs were valuable antiques not the old cars ready to break down. Arnold Marks was my Car Dad. Arnold through his kind words and wisdom brought me into the car hobby. With his encouragements I urged others into the car hobby. Little kids are not bad let them into your car. Let others enjoy your car. Without getting others in the hobby it will just dieoff. Thank you Arnold for all those memories and thank you for kind words when my father passed. He told me “ When you are working on something get mad and not know what to do ask your Dad can you give a hand. It will be then that little nudge will be him helping you.” Arnold Marks left us and now when we are working on our Mustangs and frustrated. We can ask Arnold for a little help. The angel that he is now will nudge us in the right direction. I insist you should buy a car like mine but I wont pay for it.